While rubbish bins are generally not much to look at, keep your eyes peeled for some that are looking a whole lot prettier thanks to some creative school students. Stickers have been placed on 200 bins in parks and open spaces across the City, all of which have important waste messages. Hundreds of students from 14 schools within the City entered the Bin Sticker Competition, where they were tasked with designing a bin sticker that would encourage the community to reduce litter. James (10) from Rawlinson Primary School, Lena (11) from Tapping Primary School and Neiva (8) from Mindarie Primary School had the winning designs, chosen by the City’s waste truck drivers. Wanneroo Mayor Tracey Roberts said this wonderful idea came from seven-year old Beau from Two Rocks Primary School. ‘Take 3 for the Sea’ – meaning pick up three pieces of litter every day to stop them from entering our oceans,” Mayor Roberts said. “Always keen to engage with young people who want to do their bit for the environment, the City’s Waste Education Officer worked with the school to design and create some persuasive posters to be placed on park bins around Yanchep and Two Rocks. 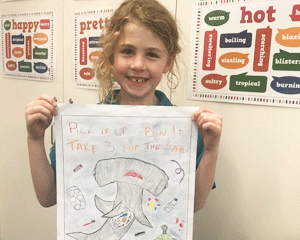 “Following the success of what the Year 2 class were able to create, the bin sticker competition was extended to all schools across the City of Wanneroo.